Cool! Where Do You Buy Your Supplies? Click here to see the entire list of Commonly Asked Craft Show questions. Cool! Where do you buy your supplies!? Being diplomatic at all times is a good business skill to learn and there’s no better time than right now. Here are some different answers for this pesky question based on your comfort level with freely sharing your knowledge. At Otion, one of our Core Values is that we freely share information. I generally divulge everything I can without jeopardizing our core business. Where you fall on this scale (stony silence to verbal fountains) determines how friendly and encouraging you’ll want to be with this answer. Having just watched the Indie Beauty Biz Interview post above, I’m feeling more strongly than ever that there is enough for all of us. There’s something so special about the sharing & encouragement that happens in the soap world. I think karma takes care of us! I make soap for a hobby, but I sell my art professionally, and I get asked similar questions. Where do I get my frames, what kind of paint do I use, what paintbrush, etc. I’m happy to tell ’em where I get everything. I know it won’t hurt my sales. The magic isn’t in the materials, it’s in the artistry and long hours of practice we bring to our craft. Most people understand that. Anyone who says “I can do that myself” isn’t really a customer, are they? Regina, We’re super lucky with our search engine placement and feel lucky that we come up in the top three for many categories. Shanster, I agree with you that it’s nice to find fellow soapers who freely share knowledge. Sometimes, when you’re at a craft show, selling your wares, on your feet all day, away from family for the weekend, having driven hours to set up at the crack of dawn … well, sometimes, anyone asking you where you buy your supplies just feels like an afront. It really depends on the setting I think. At a soap gathering and meeting, you would naturally expect information to flow at a generous and open rate. At a craft show, where you are there to sell, sell, sell, the mindset might be different. Shanster brought up some very interesting points. 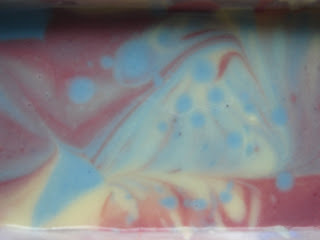 I intend to hone my soap-making craft, but I am pretty certain I will also continue to patronize other soap makers, not only because the ones I’ve met tend to be such super nice people, but also because, like Shanster said, everyone makes it differently, and I love to try different things even if they are variations on a theme! But it seems that without all the divulging of information I got at a conference I attended with Anne-Marie where people were really upfront and honest, I would never have thought I could do it! I don’t want to “hide” the information I got – it seems sorta wrong when I got the information that way too?? It is definately a fine line to walk! I figure most people won’t want to go thru all it takes to find packaging, labels, look, scents, figure out a price, and then hoof it to sell it. And no one will do it just like me…we all have so many different ideas and viewpoints! Wow! “soap supplies” search and brambleberry is number 2 in the list!